NOTE: The information in the following article has been derived from copies of articles that I purchased from the Strong Museum of Play, or more specifically, the Sid Sackson Collection at the Brian-Sutton Smith Library and Archives of Play located within the Strong Museum. The museum houses a large collection of Sid Sackson artifacts, which allowed me the ability to pour through numerous personal diaries, letters and manuscripts to try to construct an article that helps to tell the story of Sid Sackson’s greatest creation. I have also added some of my own observations and juxtapositions to help piece together this history as there is some information that just can’t be found. Little did he know that he was laying the ground work for what would become his best and most successful game idea out of the hundreds that he would produce in his lifetime. Sid was obsessed with games. He amassed an extremely large collection of games as he would buy games outright and also be given games to test on a very frequent basis. He would intensely study all the games he received to see if they were interesting or to determine if he could improve on the idea. He also ordered game patents from the Library of Congress, as a normal routine, to study games from the past. He was always looking to create new games by improving on ideas that were good ideas but needed a little help to improve their appeal. He was highly respected in the game community. In this same undated manuscript Sid used a pencil to cross out the name of “DECISION” and rename the game idea “VACATION – The Game of Hotels.” This change was done after June 3, 1959 because that is the date that Sid submitted the idea for the game of DECISION to his gaming agent, Alice at I-S Unlimited. DECISION was submitted to his agent on that day in June 1959 along with three other game ideas, Carre, High Spirits, and Red Letter. 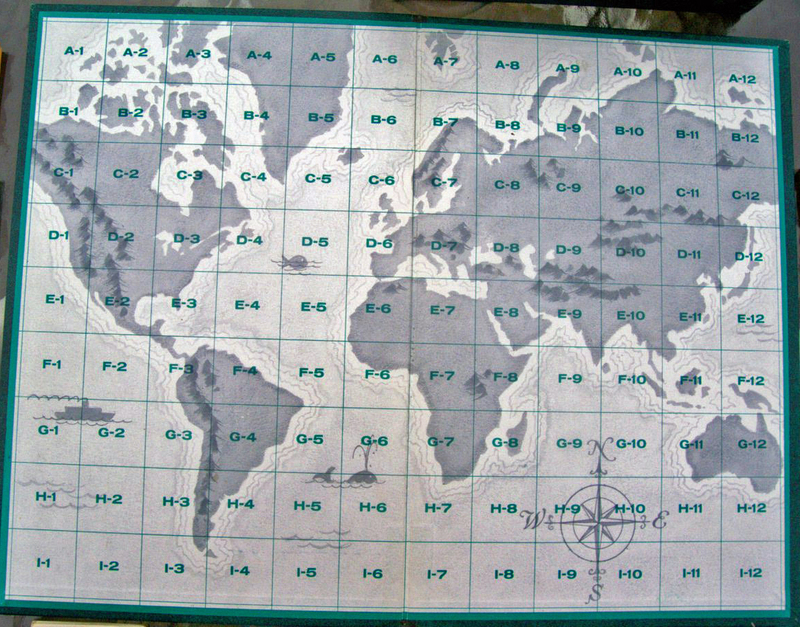 He proceeded to draw a game board that listed a different city in the world on each of the 108 squares on the board. Sid also put a pattern of designations on the squares that range from A-1 to I-12 which is similar to the way that a Microsoft Excel Spreadsheet is set up today. He grouped the cities from different continents on certain sections of the board. In another drawing, he depicted the tiles for the corresponding squares to have the name of the city along with a picture of a hotel relating to the design of the city and the square designation. Sid was very thorough in everything he did, drawing a detailed picture on all 108 tiles. This built a symmetry that would evolve during game play as the board would begin to have the appearance of different continents as the chains grew in size. This gave a total of 200 Stock Cards and left 140 to be purchase during game play. 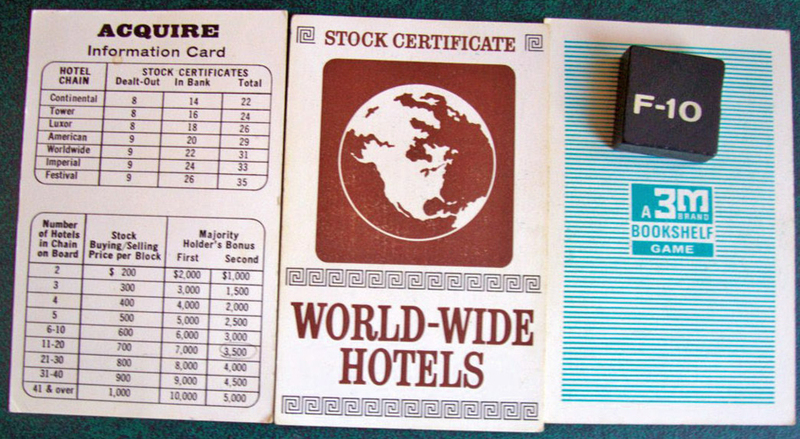 Since the players were given an equal share of the sixty distributed stock cards at the beginning of the game, they could only purchase one stock per turn during the game. This manuscript also shows the struggle Sid had with trying to write rules for a two player game. When he changed the name, he also crossed out his attempt to construct rules for such a game and at the top of the manuscript he changed it to read “From 3-6 players.” DECISION and subsequently VACATION were ideas that were too difficult to corral to just two players. To this day, four players is optimum for a balanced game. On Tuesday March 26, 1963 Sid was contacted by his agent, Alice at I/S, concerning the quest by the 3M Company to test market 3 new games in the Midwestern U.S. and that they were looking for more games. The 3M Company, Minnesota Mining, & Manufacturing, had recently hired William Caruson to create a board game division within the company. The 3M Company had recognized that due to technological advances in the work place combined with newly evolving labor laws, the average American had more leisure time. They also recognized that most board games were directed towards children and not adults. So, the 3M brain trust decided that they would try and fill the new void in the lifestyle of the average American family by creating a series of adult “bookshelf” games that were directed towards increased social interaction. The company was looking for games that they could fit into a box that was the same size as a normal book so that they would fit on the bookshelf. By the next day, Sid was busy creating a box design for his game of Vacation. Three days later on March 29, 1963, Sid took the game of Carre and Vacation to I/S Unlimited. By April 2nd he was already meeting with Bill Caruson at the offices of I/S Unlimited. The meeting also included Larry Winters who had created a game called “Auction Block” that 3M also had interest in. During that meeting, Sid gave 3M the game manuscripts for Data, Carre, Copade, & Vacation. By the next day Caruson provided feedback. He liked Vacation but thought Data needed some work. By April 22nd 3M had rejected the idea of Carre. But, two days later on the 24th, Sid was notified that they liked the idea of Vacation and they wanted approval to test market the game that upcoming Christmas season. Yet even though the 3M Company was asking for approval, they still were not willing to commit to the game. They stated that they would make a decision by mid-May. On May 17, 1963 Sid was notified that 3M had sent money to hold the rights to the game of Vacation for a longer period of time. On June 11, 1963 Sid was contacted by Alice and told that Caruson had called and said that they “want to make changes to Vacation to cut costs and said they would send a letter with explanations”. After that June 11th Diary entry, Sid did not mention the game again until September 9, 1963. On that day he wrote, “3M wants to change Vacation to ACQUIRE.” I can only assume, without the access to further information, that the 3M Company already had a working idea for a game called ACQUIRE and then stumbled across the idea that Sid sent them. I make this assumption because the artwork for the eventual mass production box for the game of ACQUIRE is dated 1962 and they didn’t get Sid’s idea until March of 1963. 3M had probably developed the artwork the year before and then just tailored it to Sid’s idea. The first test market games of ACQUIRE were dated with a copyright of 1963 but when it came time to mass produce the game in 1964, 3M chose to use the 1962 copyright of the artwork on the outside of the box and the 1963 copyright of Sid’s idea on the inside box with the rules. 3M had mentioned that they wanted to make changes to Vacation to cut costs so by making the name change to fit some previously constructed artwork made sense to save money. Yet by comparing Sid’s original manuscript to the test market games that were produced we can see some of the other changes made by 3M. Sid had envisioned a board with squares that designated different cities around the globe and were clustered into continents. 3M made the board into a picture of a world map and the squares only had the squares designation. 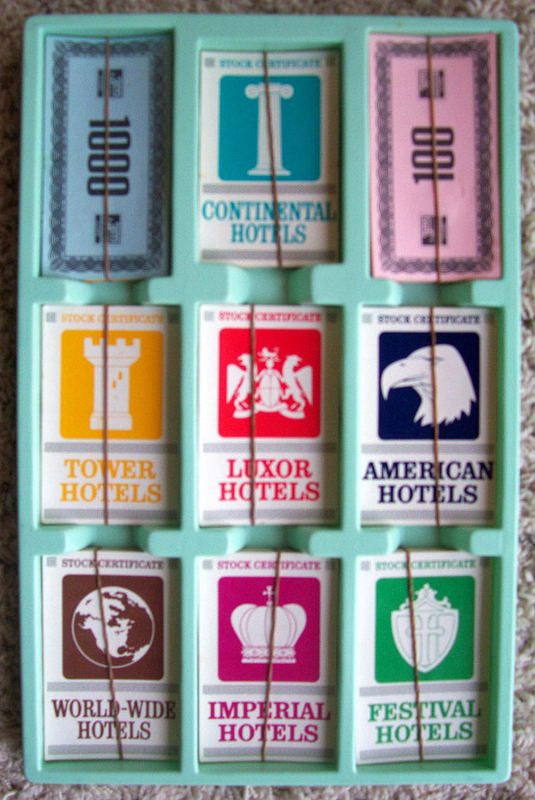 Sid had also envisioned tiles that had various forms of hotels printed on them and the 3M Company made the tiles out of wood with the squares designation printed on them. 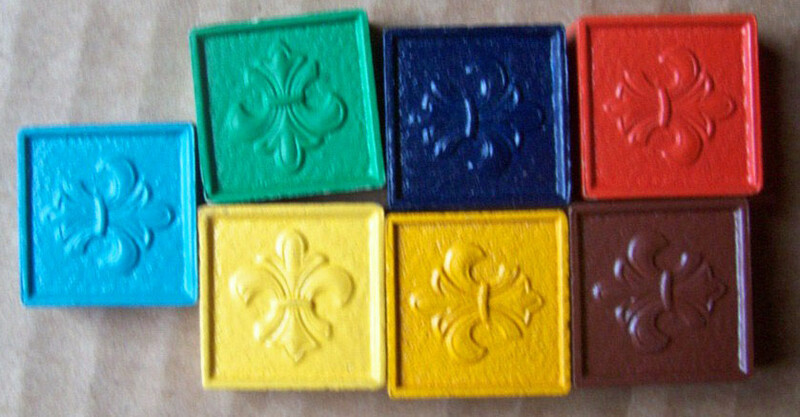 The chipboard method of tiles that was designed by Sid would probably have been cheaper to produce after the artwork expense, and Sid actually suggested that method in a later letter, but I believe 3M used the wood tiles because they were the same wood tiles that the company was using in other bookshelf games such as Phlounder and Quinto. Since 3M could use the same type of wood tile in all three games they could reduce their costs overall. 3M changed the names of Wilton and Sharedon to Tower and Imperial. 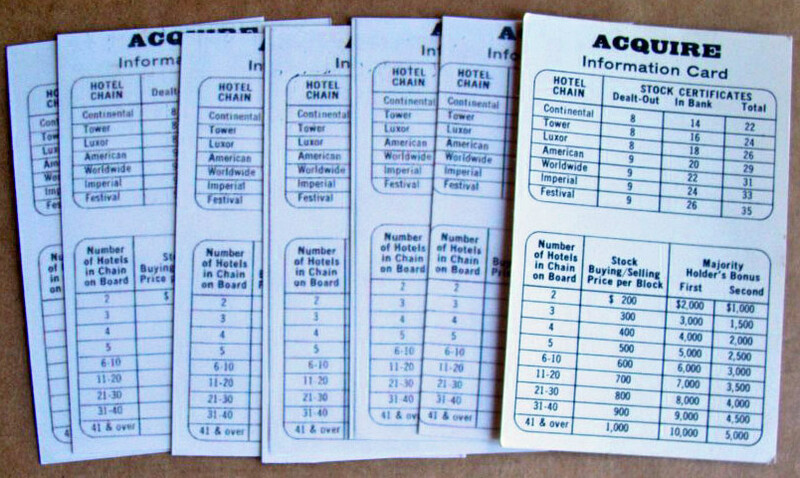 They also decided to print all 200 of the stock cards on white card stock instead of printing 140 on white card stock and the sixty to be shuffled and dealt on yellow card stock. This move also saved them money in production. By September 20, 1963, 11 days after the notification of the name change, Alice of I/S Unlimited was already writing a counter offer to a contract offered by 3M for the game of ACQUIRE. 3M had constructed a contract offer that was heavily skewed in their favor. The first issue that was addressed was the fact that 3M had offered a limit of royalty payments in the amount of $25,000. Sid’s agents would accept no less compensation than royalties for the life of the game. Considering the continuing life of the game of ACQUIRE, this was a very wise move. 3M also wanted Sid to “assign all interest” in the game of ACQUIRE to them. His agents wanted them to only have the right to “make, use, and/or sell” the game. His agents also wanted the rights to the game of ACQUIRE to come back to the inventor when the company decided to discontinue the “production, marketing, and promotion” of this game. It may have been beneficial to ask for the right to take the game back from the company if the inventor was dissatisfied with the companies efforts to produce, market, and /or sell the game since the contract and rights are stated to continue if 3M chose to sell its interest to another company. One of the last issues in the contract was to address possible competition or “knock-offs” of the game. 3M wanted an automatic suspension of royalty payments to the inventor if they had to enter litigation against a knock-off game. I/S Unlimited argued that the royalty payment should be reduced by the amount of the cost of litigation. Either way, Sid or his heirs would be responsible to pay for litigation and it would not be the responsibility of the game company to protect the game against competition. It only took 19 days and Sid was writing in his diary on October 9, 1963 that he “Went to I/S Ultd. Inc. about ACQUIRE contract.” Two days later he writes “Signed contract for ACQUIRE (Vacation).” It appears that he was still trying to adjust to the name change since it had only been proposed a month prior. Since this was Sid’s first major contract for one of his game ideas, the last month was most likely a huge whirlwind for him. 3M had latched onto his idea, incorporated it into another idea they had been developing, and were poised to get it on the market rapidly. Eleven days later on November 1, 1963, Bill Caruson of 3M wrote a letter to Alice Nichols at I/S Ultd telling them the cities in which the first games of ACQUIRE will be test marketed. The eight cities that were chosen were all in Mid-America. They were Shreveport and New Orleans, Louisiana, Madison and Milwaukee, Wisconsin, Des Moines, Iowa, Kansas City, Kansas, St. Louis, Missouri, and Denver, Colorado. The choice of these cities was probably in relation to the location of the 3M Corp in Minneapolis, Minnesota. Mr. Caruson also wrote a letter to Sid on the same day telling him that “We should have finished games sometime next week, and I will get one in your hands just as soon as possible.” Three days later, on the 14th of November 1963, Sid wrote in his diary that he received artwork and instructions. By November 27th, Mr. Caruson was writing a letter stating that they had the games completed and they would send one to Sid. Caruson complained about the artwork on the money and said it could be corrected on future production runs. There was also some problem with the box sleeve that made it crooked. 3M was rushing to get this corrected so the ones that hit the stores did not look as bad. By November 30th, Caruson tells Sid that his copy is on the way. Sid’s agent, Alice, received her copy by December 2nd. Sid didn’t get his until the 10th. He wrote a letter to Caruson on the 13th stating that he was a little upset with the Post Office. Sid was very impressed with this first game. He also outlined mistakes that he had noticed and changes he would like to see made. One of the changes Sid suggested was that “One pointer I would like to see in the tips is to keep on the alert for the opportunity to pick up a “second bonus” cheaply. Very often players will get into “ruinous” battles for “first” in one chain while neglecting the chance for “second” in other chains from just the purchase of one or two stocks.” This advice never did make it into the rule booklet but it still remains solid advice today. In a December 21, 1963 diary entry Sid writes, ““Played ACQUIRE with Dad & Dana.” Sid was first notified on April 24, 1963 that 3M was interested in his game called “Vacation,” now just 8 months later he is playing his game. His original idea has been modified slightly and the name was changed but it was his game, produced by a major manufacturer. On December 31st, at the end of that year, 3M had already sold $1,029.80 in games. (Approximately 148 games) Sid’s 5% royalty netted him $51.49. (Approximately 7 games) The game of ACQUIRE had come to life.